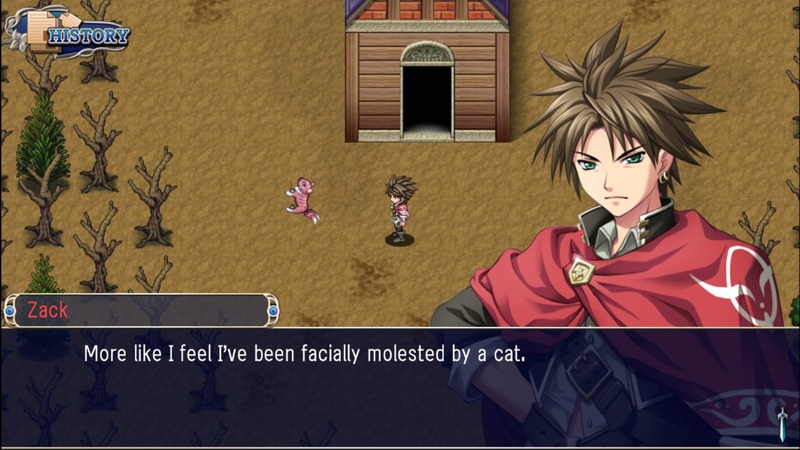 Asdivine Hearts is a frustratingly beautiful game, as it both demonstrates some of the most exemplary efforts Exe-Create and Kemco can produce, and yet suffers from some of the most troublesome development decisions. Although this is one of the earlier efforts in their ever expanding JRPG library, Asdivine Hearts is one of the most complete, fulfilling, and impressive games they have achieved. And while I understand that missteps are a result of first attempts, these flaws are nonetheless aggravating. This brilliant and nonetheless exasperating game is a clash between charm and vexation. 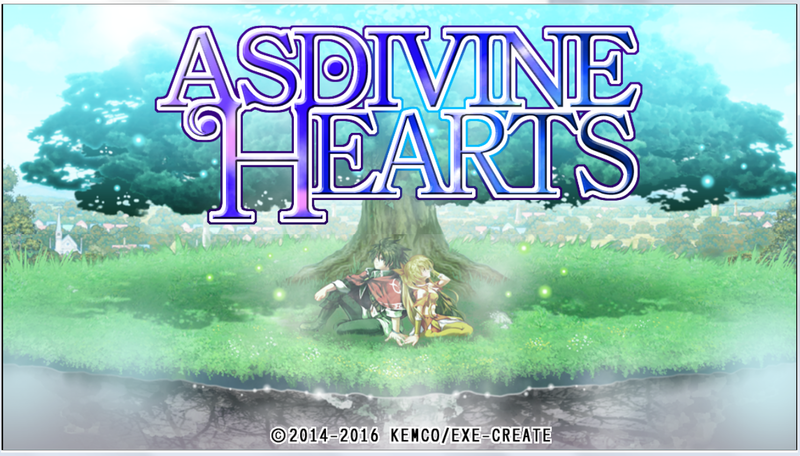 Asdivine Hearts tells the story of two deities at odds with one another. Once united in their creation and watchfulness over the world of Asdivine, the Shadow Deity seeks to tip the balance between him and the Light Deity towards himself and transform the world to his ideal. The Shadow Deity drives the Light Deity down to Asdivine to weaken the influence of Light on the world. It is here that the Light Deity meets our hero, Zack, and his companion Stella, along with an unlucky wildcat. Along the way, they meet the enigmatic girl, Uriel, who claims to have been rescued by Zack previously, and Celine, a High Priestess with fierce loyalty seeking to prove herself. The fate of Asdivine is caught in the middle as the far more enigmatic and impassioned intentions of the Shadow Deity are revealed and it’s up to our heroes to stop him while coming to terms with what their actions could mean. Right from the start, it’s clear that Asdivine Hearts is a story worth investing in. The main plot is alluring and enveloping and I remained intrigued and satisfied throughout. Also of note, there’s actually a subplot! Revolved around Uriel and nicely weaved into the main plot, this subplot opens up opportunity for developing Uriel’s backstory and a bit of character development. While I wish this subplot lasted longer, as it’s connected to and taken over by the main plot, it’s a much appreciated addition and incredibly noteworthy, especially since this and the main plot’s level of depth are the best I’ve seen from Exe/ Kemco so far. Equally impressive is the narrative as, whether it’s the dialogue between characters or their inner thoughts and mumbles, is full of humor and lightheartedness. I especially like these inner monologues, as they not only give us glimpses into the characters’ thoughts, but they also bring significant character development, which nicely adds to the experience. For example, I like Zack’s rough and informal demeanor, Stella’s anxiousness and feistiness, and Uriel’s brutal straightforwardness. I also appreciate how the storytelling and cutscenes make the special endings more believable. Similar to Antiquia Lost, there are extra ending scenes in which Zack may end up in a relationship with another character based on Trust level. Here, each pairing is believable, as the love quadrangle is directly addressed among the women and Zack also has memorable interactions with each character. My only complaints are that, for one, I wish there were more of these interactions showing Zack’s budding relationships. They are perfect opportunities for further character development and to solidify the believability of the pairings. Secondly, I didn’t like how some story elements and peculiar details are just thrown at you from time to time. It’s nothing too upsetting and they do serve to move things along, but the randomness is slightly discordant. Finally, I do wish the characters had more complexity and depth, as their personalities tend to fit molds we’ve seen repeatedly in this genre. It’s a similar complaint I had with Revenant Saga and its characters, but, having said that, there’s noticeably more depth here, which I’m grateful for. Overall, the plot is immersive, the narrative is strong, and experiencing it all is a real pleasure. As for gameplay, Asdivine Hearts is another mix of tradition and innovation. 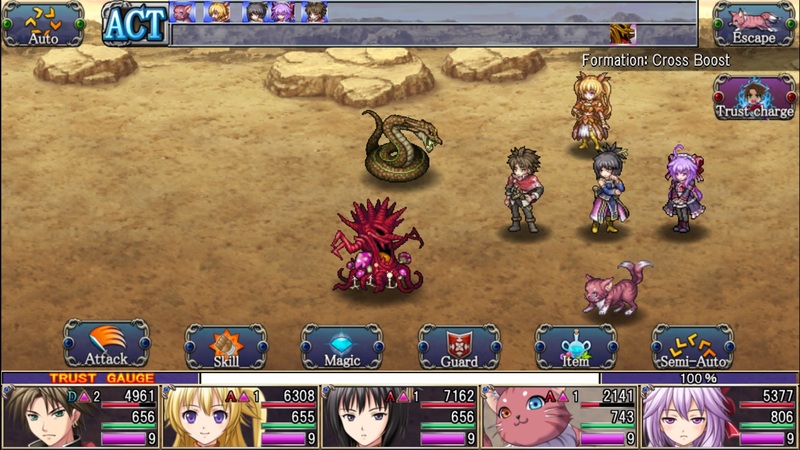 This game, just like Antiquia and Revenant Saga, features a robust combat system that combines classic turn-based mechanics with a few unique additions. Old familiars, such as leveling up, unlocking skills and spells, and post-battle point gains are all present. We also see ally and enemy positions influencing the damage inflicted and taken. A new mechanic is the use of Formations, in which you can choose from a number of setups. Each Formation has its pros and cons, for example, some will give the entire party a speed or intelligence boost in exchange for extra damage received. Others, like the Cross Boost, may provide different stat boosts to individuals depending on their placement in the Formation. New Formations are found throughout the game and using the right Formation may tip the odds in your favor. 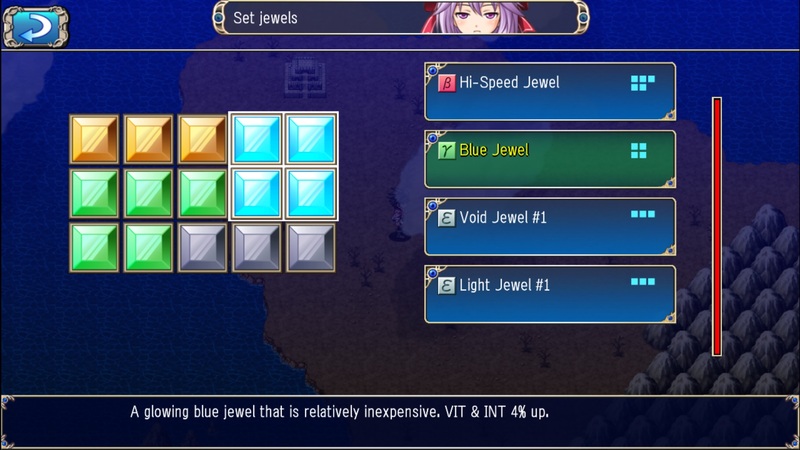 Another new feature is equipping jewels to a Rubix. Every character can equip a Rubix accessory and set various shaped jewels into them depending on space available. The more powerful or unique the jewel, the more quizzical the shape. Speaking of jewels, you also have the ability to synthesize new jewels. By visiting synthesis shops, new jewels can be created, giving more powerful and unique abilities. A previous mechanic, the Trust system makes a return, influencing which special ending you unlock at endgame. Trust, however, does not seem to influence other gameplay mechanics this time around. Subquests, some of which are now repeatable, also make a return, as well as new, repeatable Missions, in which ten of a specific enemy must be defeated for rewards. Finally, there’s also a Menu Shop in which ultra-rare and unique items can be purchased with AHP, or Asdivine Heart Points. As for the quality of its execution, starting with the high points, combat is solid and tight, needing little effort to master. I also like the different spell types available and how ranking up all three types unlocks an even more unique set of spells. Also, I find the jewel system innovative and intriguing. And, I always appreciate the detailed tutorials and Help menu; that’s something Exe/ Kemco continue to provide and it’s always extremely helpful. Gameplay execution, however, is where the game suffers most, as its shortcomings are apparent and abundant. First, this game follows the Exe/ Kemco trend of relying too heavily on its combat. The main Quests, Subquests, and Missions all require clearing dungeons and hunting down enemies. This isn’t too bad, since it actually addresses a greater issue. This game is tough and requires some grinding. Rather than genuine challenge, the game is instead set up to hamper you with unbalanced enemy difficulty and an obnoxious demand for EXP points. Leveling up can be a chore and little help is provided in the ways of weapons, accessories, and jewels. However, it is doable with patience and some pre-planning with jewels and synthesis. Speaking of jewels, I felt the jewel and Rubix feature could have been more forgiving, since many of the higher powered jewels are too large or radically shaped to set several at a time. So, it becomes a chore to find a functional combination of jewels that can keep your units alive during those more difficult battles. In fact, I’d recommend finding a guide to plan ahead for synthesizing the alpha level experience jewels to boost EXP gains. Fortunately, by the time grinding alone is not enough to counter the difficulty spikes, you will be able to synthesize an EXP alpha gem or two for increased EXP point yields. Ultimately though, grinding shouldn’t have to be a necessity and, as I found, this and the repetitive nature of gameplay breaks flow and player immersion. And again, while I found the story interesting, its natural flow, too, is held up by these developmental missteps. Too many breaks in gameplay hurts overall immersion. Also slightly broken is the Trust system. In Antiquia, you need to give gifts as well as interact correctly during cutscenes to gain Trust. Here, cutscenes alone will give enough Trust and you’ll need to purposely give the wrong gifts or interact incorrectly to adjust levels if you want to see specific endings. Also like Antiquia, there is a hierarchy of who gets priority if there are ties in Trust levels, so again, planning ahead is necessary. Having said that, it really isn’t the biggest problem to work through. Finally, there’s the Menu Shop, which is rendered almost useless. Unlike Revenant Saga and Antiquia Lost, in which the devs implemented additional ways to earn Shop points, here, the special AHP points cannot be automatically earned after fighting set numbers of battles. Instead, they are either found randomly by smashing rocks that may show up during battle or can be earned from the arena. However, the rocks hardly ever drop these points and the arena is too difficult at first and by the time you are able to return to the arena, you would have already figured out alternative means of progress. All of this has a slight stench of a pay-to-win scheme, relying on in-app purchases (in the mobile versions) for these points. I’m very glad Exe/ Kemco removed this need for the PC versions of their other games, as you pay for “full versions” via Steam, but here, the devs failed to properly address this issue. Again, though, grinding and careful planning can successfully counter this issue, yet it’s still frustrating to see remnants or shreds of such a deceitful, greedy practice. Despite the dubious execution of gameplay mechanics, Asdivine Hearts delivers with its aesthetic beauty. The artistic direction, sprite work, and portrait work are all vivid and fantastic. The tilesets are dynamic and are utilized well, prompting a lively feel from the cities to even the smallest of villages. Sprites are detailed and unique and I especially like the viciousness of the many enemy and boss designs used throughout. The portraits do an excellent job of bringing the heroes’ personalities to life, adding to the well written narrative. Zack’s piercings and wild hair fit his informal demeanor and Uriel’s blank, almost expressionless veil speaks volumes to her no-nonsense style. 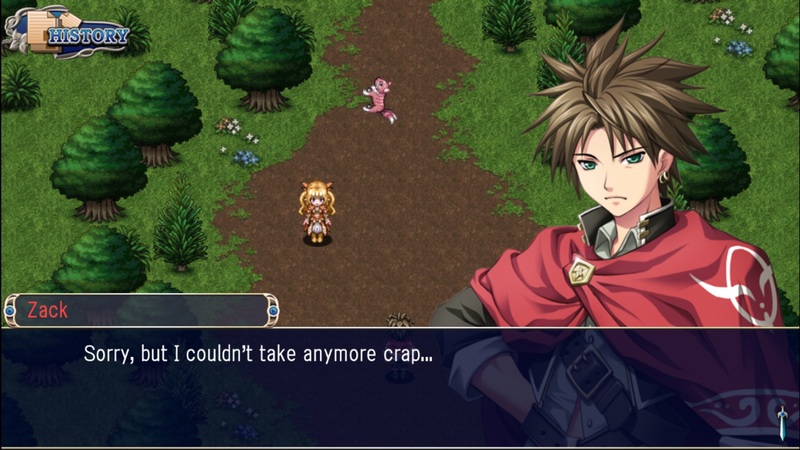 In trademark Exe/ Kemco fashion, the overall visuals are stunning, immersive, and full of meaning. Also in their trademark fashion, the audio effort falls completely flat. Again, the soundtrack only serves the purpose of substituting silence. Too few tracks that lack any heart or emotion and their overuse only hurt the experience. While it’s a shame the audio quality doesn’t compare to the striking visuals, taken as a whole, the aesthetic quality remains very high and are a joy to take in. Simply put, the pros and cons of Asdivine Hearts are equally prominent. The quality story and character development are gratifying and considerably appreciated. The combat system is dynamic and tight, easy to learn and fun to master. The visual aesthetics are some of the best Exe-Create has to offer. Nevertheless, the troublesome difficulty, the repetitive gameplay, and that oh so slight hint of a pay-to-win scheme (again, though, it’s absolutely manageable) all stand out enough to mar the overall experience. The game was easily on its way to a 4 or more star rating and it pains me to see stellar achievements tarnished by such grave faults. Yet, I definitely had many more moments of enjoyment than frustration and so I am resolute in giving Asdivine Hearts an above average score. Patience and some grinding are necessary to see it, but there is a wealth of satisfaction and charm to be found.